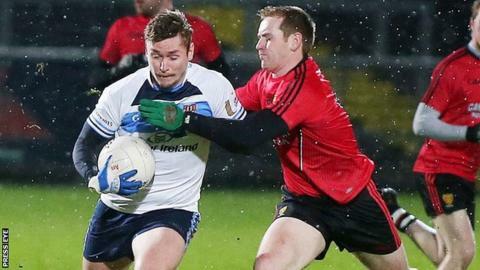 Down moved a step closer to the McKenna Cup semi-finals making light of terrible playing conditions in Pairc Esler to beat Ulster University. Conor Laverty's goal helped Down lead 1-5 to 0-3 at half-time with Mourne man Caolan Mooney on target for UU. A controversial 41st-minute goal by Niall McKeever cut Down's lead but the home side regrouped to take the win. Down must wait on Sunday's last Section A game between Cavan and Monaghan to see whether they have done enough. Jim McCorry's Down side have four points from their three games with Cavan and Monaghan both on two points from two matches. In Wednesday's match, the home side got off to a dream start with a goal from Laverty after 55 seconds as the tiny forward out-jumped his marker to fist Arthur McConville's long ball into the net. Former AFL star Mooney scored a superb long-range point for the students in what turned out to be UU's only score from play in the first half. Mayo forward Cillian O'Connor showed superb judgement to convert tricky dead ball chances into a difficult wind as UU trailed by 1-5 to 0-3 at the break. Down carved out a few nice scoring opportunities before half time with Donal O'Hare, Conor Maginn and Danny McKay all scoring from play. Down goalkeeper Stephen Kane showed great reflexes to save Caolan O'Boyle's thunderous shot after 27 minutes, with the home side taking a five-point advantage into the interval. O'Hare and Peter Fitzpatrick stretched Down's lead in the opening moments of the second half but Antrim player McKeever was credited with a bizarre goal for UU after 41 minutes. He appeared to foul the 'keeper, who spilled the ball into the back of the net, but the score was allowed to stand and half-time sub Paddy McBrearty followed up with two quick-fire points for UU. Jordanstown keeper Sean Fox made great saves from McConville and Niall Madine but Down pulled clear in the last 10 minutes helped by scores from Cathal Crilly and Conor Laverty.